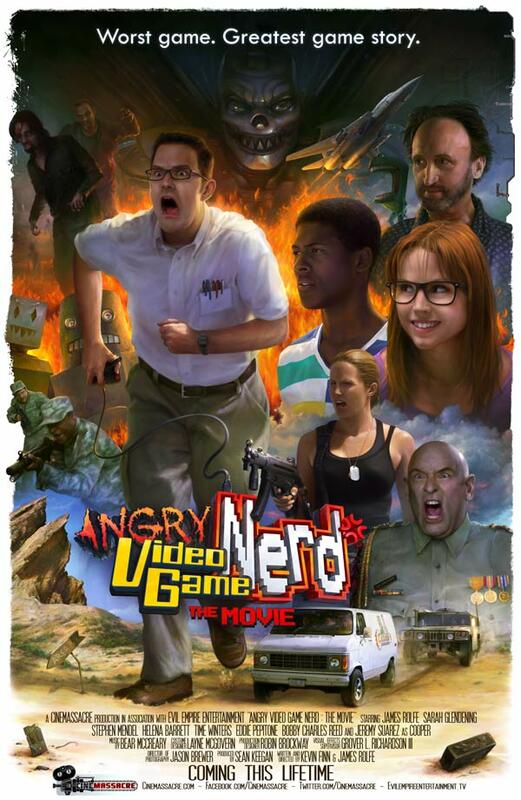 Based on the web series of the same name, Angry Video Game Nerd: The Movie sees The Nerd tackle what is known amongst gamers as the worst game ever made – E.T on Atari. This propels him into a journey of epic proportions, blending the likes of sci-fi, horror and action together. This is one of those films that knows it is low budget and understands its limitations and rather than trying to push beyond and stretch its budget, it embraces its limitations and has a laugh about it. In fact, AVGN: The Movie might be about the celebration of gaming but it’s also about the celebration of the cheap horror movies with the obvious gore, the cheap action movies with the stereotypical chases, the cheap military thrillers with the gung ho leader-in-charge. This film tips its hat to all these sorts of genres and it does it in a really sort of clever and affectionate way that makes you laugh about it, especially if you grew up loving these sorts of movies. James Rolfe (Here Actor/Co-writer/Co-Director) definitely grew up with these sorts of movies. In fact he cut his teeth on them growing up and as soon as he was actually able to, he’s been making homages to some of his favourite monster films and so forth. It’s this kind of affection that shines through when dealing with the elements and it’s the affection for those films that make these homages here in the film more enjoyable than the standard Hollywood film masquerading as a b movie. And as well as tipping its hat to b movies, the film has a pretty goofy imagination when it comes to dishing out the game references, making the world of The Nerd equally as surreal as the episodes of the web series. This sort of goofy and surreal sense of humour adds to the charm of the film. When it comes to laughs though, the film is pretty hit and miss throughout. Some jokes and gags regarding an episode of the web series or the gaming world fell flat for me while other gags and ingenious one liners are laugh out loud funny, thanks to some of that surreal humour but also the cleverness of the writing sometimes. A definite highlight would be the musical work here by Bear McCreary, who not only wonderfully expands the series’ theme in an epic fashion but also crafts some terrific pieces that really accentuates some of the film’s more epic moments and brings the world to life. I’ll definitely have to give that soundtrack another listen and for those reading and interested in the musical side of things, definitely keep an ear out for the score. AVGN: The Movie achieves exactly what it sets out to do in becoming a film about the titular character while also celebrating b movies and gaming but it doesn’t always entirely hit the mark. Some of the characters are underdeveloped and the writing certainly could’ve used a polish here or there in places. Spoilerific places, that is – so I won’t go into it too much. It’s entertaining for it’s 115 minute running length and manages to be amusing most of the time, especially if you have a soft spot for the b movie genres it is tipping it’s hat to. The main thing though is the film has such an energy and infectious charm about it all that you can’t help but get into the spirit of the film. I don’t know about anybody else but this kind of goofy charm is hard to come by in films these days. So for that alone, I’d say this feature is worth giving a look.